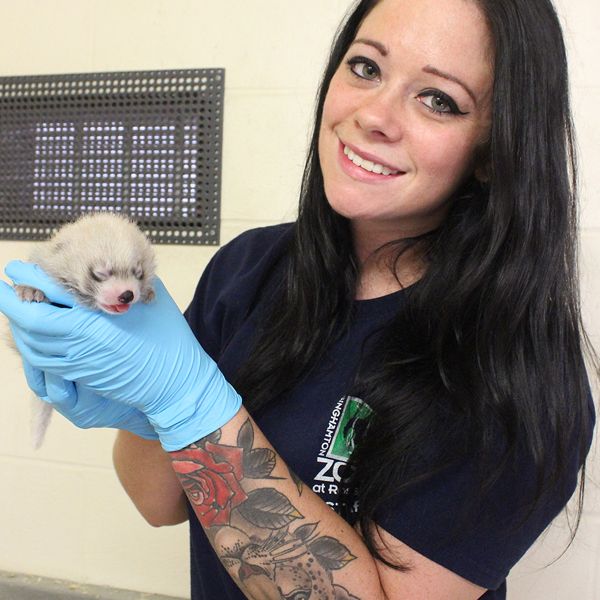 The Binghamton Zoo at Ross Park is proud to announce the birth of a red panda cub born on Saturday, July 7th, 2018 to parents Mei-Li and Ferguson. The cub has been with Mei-Li since birth and has grown as expected, currently weighing in at 387 grams. This is another impressive accomplishment for the Binghamton Zoo and the Red Panda Species Survival Plan, a program to manage a genetically healthy population of red pandas in North American zoos. Our zoo is currently active in 23 Species Survival Programs. A formal cub introduction will be announced in the coming weeks with a community naming contest. Dates and times will be shared on our social media when they are determined. The red panda is listed as endangered because its population has declined by 50% over the past 20 years. This decline is primarily due to deforestation, which eliminates red pandas’ nesting sites and sources of food. Through the Association of Zoos and Aquariums (AZA), the Binghamton Zoo participates in several Species Survival Plans (SSP), ensuring the long-term health and survival of captive species, including the red panda. Red pandas can be found in the Himalayan Mountains in parts of Buma, Nepal, India, and China. Contrary to popular belief, red pandas are not related to the giant panda, but are closely related to the raccoon family. Red pandas spend most of their days sleeping in trees and are most active at night time. They are herbivores, eating berries, leaves, grains, nuts, fruits, flowers, and bird eggs. Litter size ranges from one to four young. The young remain nest-bound for about 90 days after birth and reach their adult size at about 12 months. The maximum lifespan for red pandas is 14 years.